If you are looking for an active, authentic, and diverse learning environment for your elementary-aged student? 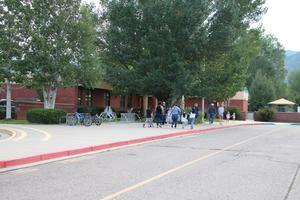 The Juniper School will keep the Open Enrollment for student applications open until September 30. 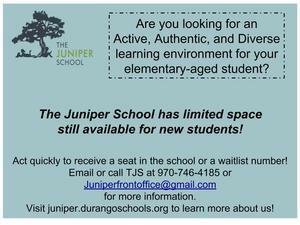 Please visit juniper.durangoschools.org/enrollment to access the application for enrollment into TJS K-5,public, elementary school. 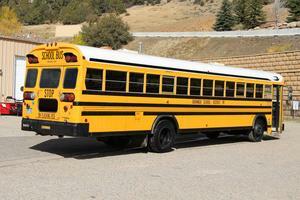 Call 970-764-4185 for more information or to schedule a school tour. Earth Farm at James Ranch (and family at TJS) has about a dozen jack o' lantern pumpkins left just in time for Halloween! 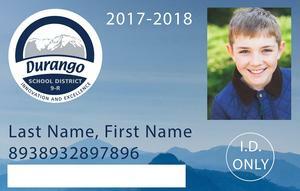 Heather will have them available for a Juniper family discount after school on the front lawn after school today. Their farm endured a lot of challenges this summer between fires, flash flooding with mud slides and then drought conditions. It was amazing that any pumpkins survived and these are the last of those beauties! Thank you for supporting one of our fellow families. 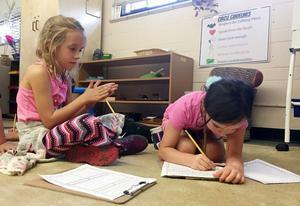 The Durango Herald wrote a wonderful article about Juniper's Mixed Age Model. 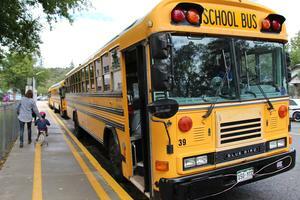 The Juniper School has a new app. Please download the app for your Apple or Android to be up to date on all the latest information. In March, the Durango Airport was celebrating its 30-year anniversary of its terminal! To celebrate, the Airport reached out to area schools to host an art contest and they received some great art pieces! Displayed currently in the Airport, five winners from 9-R schools were celebrated.